Listed below are the basic items recommended for a 5 hour plus winter walking route on the Scottish Hills. Stuff all of your gear into a 35-40 litre rucksack. If you're coming along to one of our winter events and don't have any of the essential items listed below, please don't fret ! We can help with some of the gear, just give us a call and we'll arrange to bring along spare. Please note that if you turn up without the appropriate gear and haven't arranged for us to bring spare, your guide may refuse to lead you on the hills. A layering system needs to be considered when walking in winter. For most winter conditions, this will consist of 4 layers on your upper body : base, mid, soft shell and outer shell. Your lower body will be similar, but probably only 2 or 3 layers. The base layer should be close fitting synthetic or merino that transfers moisture away from the body. This regulates the body's temerature. Avoid cotton as this material will trap moisture, therefore lowering your body temperature once exercise stops. Merino wool tops are fairly expensive, however they don't hold onto body odour like synthetic tops. 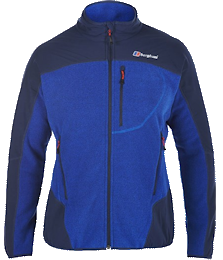 Softshell jackets are hard-wearing, breathable and windproof and provide an additional layer ontop of fleece. Although not primarily waterproof, softshell jackets are water-resistant and often worn as an outer layer if conditions are not wet or too windy. Down and synthetic alternatives, which are excellent insulators with high warmth to weight ratios, can be highly effective in extreme cold and dry conditions (but not wet) or for low intensity activities (eg sitting on summits, taking in views). The outer layer protects you from the elements of wind, rain and snow. It also enables your base and mid layers to allow moisture to escape, therefore keeping you warm. Be prepared to spend some money on your outer shell, looking for taped seams, suitable weather protection zips, wire hood (perhaps helmet compatible) and a good level of breathability (eg Goretex or eVent). Boots can be categorised into 4 categories - trail shoes, hiking boots, backpacking boots and mountaineering boots. In winter only consider the use of mountaineering boots. This type of boot can be made of leather, fabric, plastic or a combination of any of the three. There are 4 categories of mountaineering boots: B0, B1, B2 and B3. B0 boots are 3 season boots, not designed for winter use. 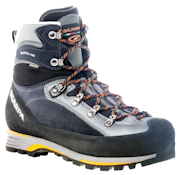 B1 boots are 4 season with a semi-stiffened mid-sole to take crampons and a more supportive upper. These boots do not have the toe or heal lips to take mountaineering crampons, therefore can only be used with type C1 crampons (see below). B2 boots have a near fully stiffened mid-sole, higher ankle profile, thicker upper. 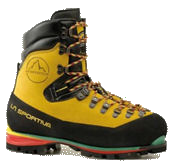 Suitable for general winter walking, glacial terrain and mid-grade climbing. These boots are designed to take crampons with heel-clip bindings, but they can also use C1 crampons. B3 technical boots are totally rigid, usually plastic and have the facility for heel clips and wire toe balls. These are suitable for hard ice climbing, glacial terrain and high altitude mountaineering. 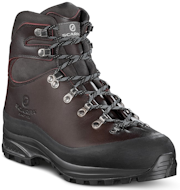 In general we would recommend that these boots are probably a bit too much for hiking on mountains in Scotland in winter as the very stiff sole can be tiring on long approaches on lower-level terrain. There is a huge variety of ice-axes with different shapes and sizes. They can be divided into three broad categories - walking, mountaineering and technical. 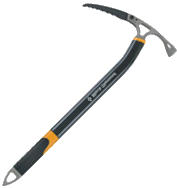 In general ice axes comprise of a shaft with a head at the top and a spike at the bottom. The head on most axes will have a pick at one end and an adze (a small shovel or scoop) at the other. 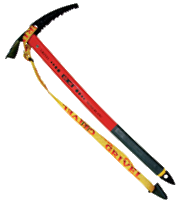 A walking ice axe is typically 55-75cm long, with a straight shaft and basic adze. These axes will have a 'B' (for basic) branded onto the adze or elsewhere. Better quality walking ice-axes may have a rubber grip on the lower shaft. Axes can come with a leash and a rubber stopper to prevent accidental damage caused by the spike (we would encourage you to remove these). Mountaineering (or Alpine) ice-axes are slightly shorter than walking ice-axes. Most have a straight shaft, tho some do have a slight bend in the upper part of the shaft (this aids swing when cutting steps in ice). The pick is more curved and the shaft is stronger than a walking ice-axe, therefore better suited for use with ropes and hooking. This type of axe will have a 'T' (for technical) branded onto the adze or elsewhere. 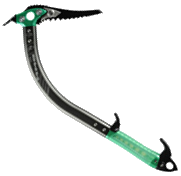 Technical ice-axes are shorter still, have curved shafts and used for climbing. They come as a pair, one axe will have an adze, the other will have a hammer in place of the adze. This type of axe is not appropriate for winter walking and hiking ! C1 flexible crampons have typically 8-10 points and are fully strapped or have a flexible cradle/strap combination. For general winter walking C1 crampons are fine and can be attached to most boots. C2 articulated crampons tend to have 10-12 points and likely a cradle/heel-clip attachment. C2 Crampons can only be used with B2 or B3 boots. With more pronounced front points than C1s, C2 crampons are fine for steep walking, scrambling or mid-grade climbing, but are also acceptable for walking on easy angled terrain. C3 rigid crampons are technical crampons for winter climbing and can only be attached to B3 boots. Due to their weight and stiffness, this type is not recommended for general winter walking. All new crampons come with anti-balling plates. These are flexible plastic sections designed to prevent snow build-up on the underside of crampons. Check the size of crampons before buying, if you have large feet, you may have to buy an extender-bar. Get familiar with putting on your crampons prior to heading for the hills ! Gloves should be waterproof and long enough to cover wrists. Take more than one pair. Consider mitts - they are warmer than gloves, but at the expense of dexterity ! Hat is necessary to prevent heat loss from the head. Balaclava, neck-gaiter, scarf and buff should also be considered to preserve body heat. In addition to your standard hill walking gear, you should consider other equipment for winter hill walking such as goggles, sunglasses, head torch (with spare batteries), sunscreen, emergency bag, hot drink in flask and poles. All put into a larger rucksack than for summer use, with appropriate fastenings for ice-axe etc. In your group you should take a group shelter, a mountaineering shovel and possibly consider an avalanche transceiver. If you're winter hillwalking or scrambling with us and don't have the full complement of gear, we can help you out with some of the kit. We can hire you a package of a Grivel pair of C1 crampons and Grivel walking ice-axe for £10 per day. 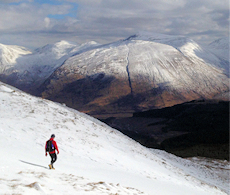 We run winter skills weekends in the Cairngorms and Lochaber. 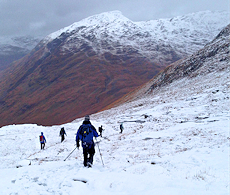 Primarily designed for the summer walker keen to aim onto the Scottish hills in winter with us, these two days introduce and develop the basic skills required to get the most out of mountain hikes with snow and ice.